• Arrive Belfast or Dublin Airport. Greeted upon arrival by Golf Vacations Ireland. • Check into The Europa 4 Star Hotel, Belfast for a five night stay. • Play Ardglass. Stunning links course in a natural setting hugging the north-east coast of Ireland, with unrivaled views, unique golf holes and memorable people. 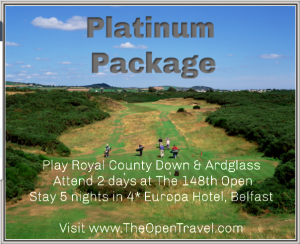 • Play Royal County Down. Rated number one course by Golf Digest in world rankings, Royal County Down is a truly exceptional and memorable golf experience. • Attend Saturday at The 148th Open, Royal Portrush. • Attend Sunday at The 148th Open, Royal Portrush. Quotation subject to availability and based on travelling 2019.